Adding floating shelves around your TV is a great way to balance the role your TV plays in your overall décor. 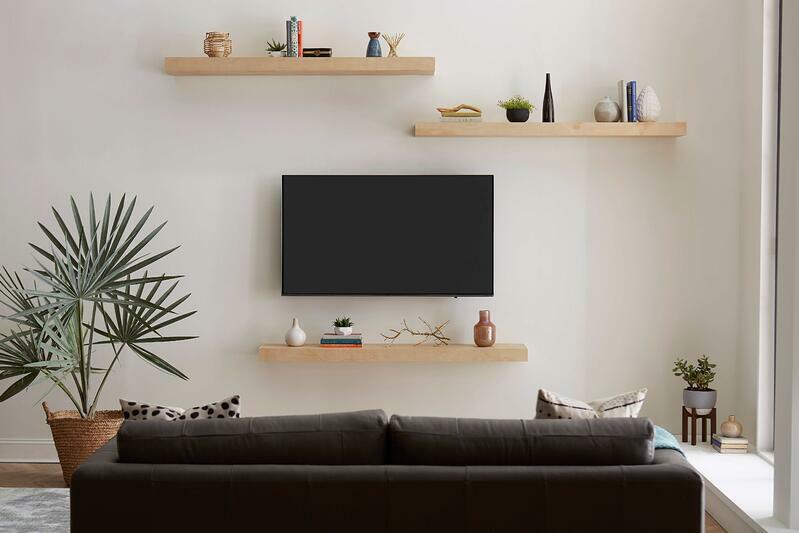 Floating shelves help draw your TV into the overall design of your room – thereby eliminating the “black box effect” flat screen TVs can create. Another big plus floating shelves have going for them is that they are a perfect maximum impact/minimum risk design option. Once you’ve decided how you want your shelves arranged, you have the freedom to add, remove and rearrange your shelf décor to your heart’s content. As shown in the photos below, there are so many ways to arrange shelves around your TV, and there’s only one hard-and-fast rule to follow: you’ll want your shelves to run at least slightly longer than the horizontal length of your TV screen. Having a few extra inches of shelf on each side of your TV makes the design feel more anchored and purposeful, and less, well, like your TV is wearing a hat. 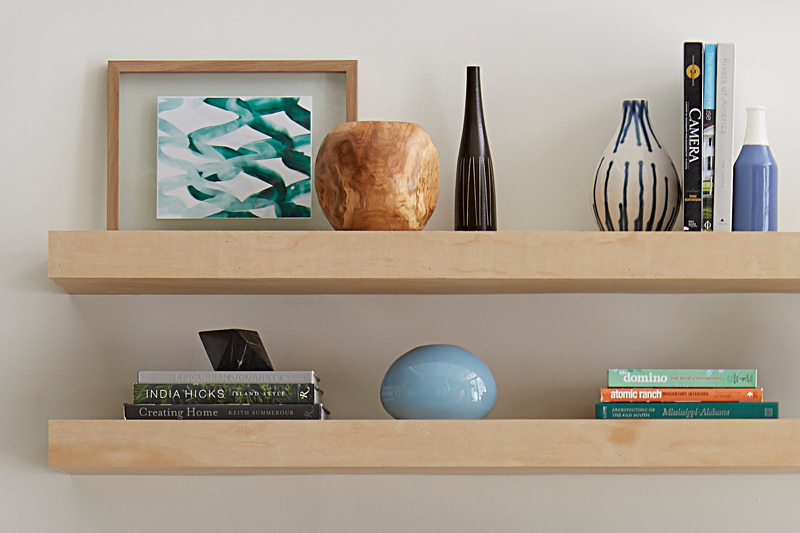 Floating shelves come in a variety of dimensions, so you shouldn’t run into any issues finding shelves that fit your space. Stores like IKEA, West Elm and even Target, stock a large variety of options – many at very reasonable price points, and if you are looking for a reason to break out your tools, this is also great DIY project. This step-by-step guide from America’s original DIY-er Bob Villa covers what you’ll need to know in order to build and install your own shelves. As mentioned, the only permanent aspect of this project is deciding where you want to place your shelves, and really, it’s only semi-permanent. If you don’t like how your shelves are arranged, you can always move them, but you can avoid that hassle by using painter’s tape to map out where they’ll look best. That way you’ll know exactly where you want your shelves before installing them. To find your ideal shelf arrangement, it helps to ask yourself a few questions: Is your style more traditional or more eclectic? Traditional designs tend to focus on uniformity and balance. Arranging shelves symmetrically as shown in the image below will keep your shelves consistent with your overall traditional style. If you favor a more eclectic style, the staggered look of the shelves will complement your more avant garde approach to decor. Another question to ask yourself is – are you a maximalist or a minimalist? If you have quite a few items you want to showcase and would find it tremendously difficult to eliminate even a few, you are a true maximalist. This means you’ll need enough shelf space to accommodate the accessories you’ll be curating. Placing two shelves above your TV and one below, is a convenient way to strike a balance between the shelves and your TV. And if you’re on the other end of the spectrum preferring just a touch of accessories, a single shelf below your TV is the perfect way to add a subtle pop of visual interest. Now let’s get to the fun part: decorating. If you’re anything like me, you have a collection of knick-knacks scattered around the house - souvenirs from sun-soaked vacations, treasured photos, family heirlooms and those pieces that just make you happy when you look at them. Maybe the best part about floating shelves is that they provide the opportunity to curate your knick-knacks into a cohesive collection. Instead of being randomly placed around the home, you bring them together to create a design that complements your style and tells a story. Go ahead and grab some of those favorite things: framed photos, small art prints, vases or ceramics, plants, candles, candlesticks, any and all objets de curiosité are welcome. Just be sure you have items of varying heights, materials and sizes. Now that you have your accessories, you’ll want to stack and layer to create visual interest. In order to create varying levels of height, you can simply stack items on top of each other. Books are great for lending additional height, and create a nice “finished” look when topped off with a small accent item like a miniature succulent or sparkly agate or geode. To create depth, stagger pieces setting some slightly in front of others. Medium-sized pieces of art come in handy here (think 8x10 or 11x14). You can prop them up against the wall and then place a vase or bowl slightly in front – and voila – you have depth. Continue to play rearranging, adding and removing items until you’re happy with you what you have. Tip: Have your phone handy so you can take photos as you go. This way you can compare the arrangement you had five minutes ago with what you have going now - with no need recreate previous work. 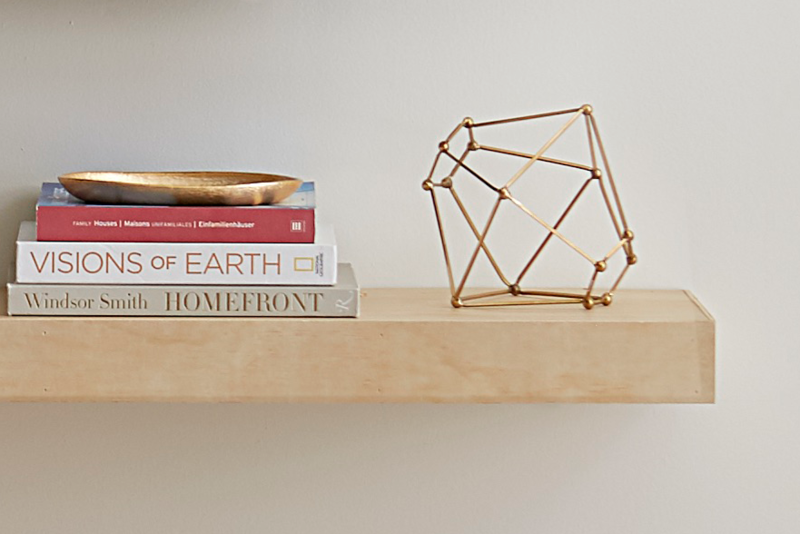 You’ll want to be sure your shelves are securely anchored to the wall. You can do this by installing your hardware directly into the wall studs, or if you need more placement flexibility, using wall anchors. If you'll be installing your shelves into studs, go ahead and use a stud finder to locate your wall studs and mark the location of your studs with a pencil. Generally, studs are located either 16 or 24 inches apart. Next, using your handy painter’s tape and a pencil, mark out where you want to place your shelves. Use a level to ensure your line is straight. If you're using wall anchors, use an electric drill to drill your pilot holes and insert your anchors. Next, proceed to attaching the internal shelf support bracket to the wall by using a screw driver to insert your screws into the wall anchors. This piece will ultimately be hidden once the floating shelf exterior slides over it. If you are attaching your shelf directly to the studs, you'll skip the wall anchor step and attach your internal shelf bracket directly to your wall studs using an electric drill and screws. Once you’ve attached your bracket to the wall, slide the shelf exterior over the inner support bracket, and stand back to take a moment to admire your handiwork. Floating Shelves with a "Floating TV"
If you’ve been thinking about mounting your TV, now is a great time to do so. I mean, you have your tool belt out, right? And mounting a TV uses the same tools required for installing a floating shelf. 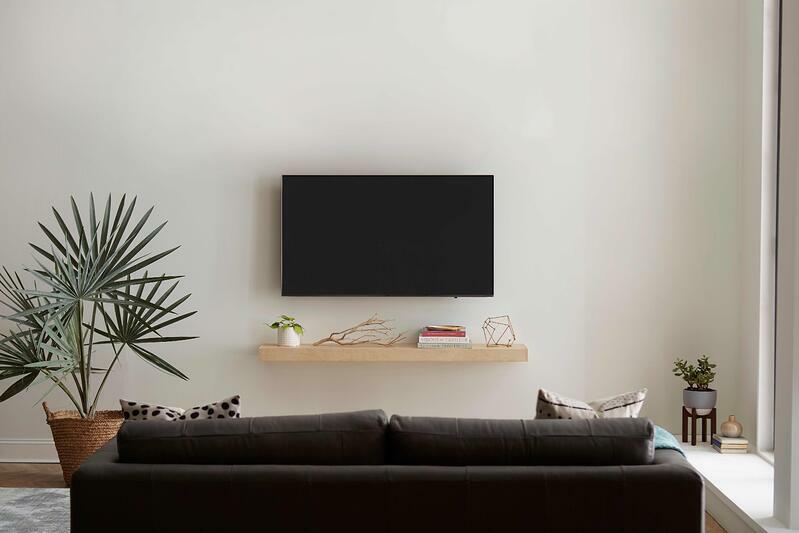 Not only is it convenient to take care of these items at the same time, but the floating effect of a mounted TV mirrors the look of floating shelves, which really takes the aesthetics of your shelf setup to another level. For a comfortable view of your TV, you'll want the center of your TV to be approximately 42 inches from the floor. If you need to mount your TV higher than that, a tilting TV mount is a great way to get a more comfortable view of the TV screen because it allows you to tilt your TV downward in order to eliminate neck strain. 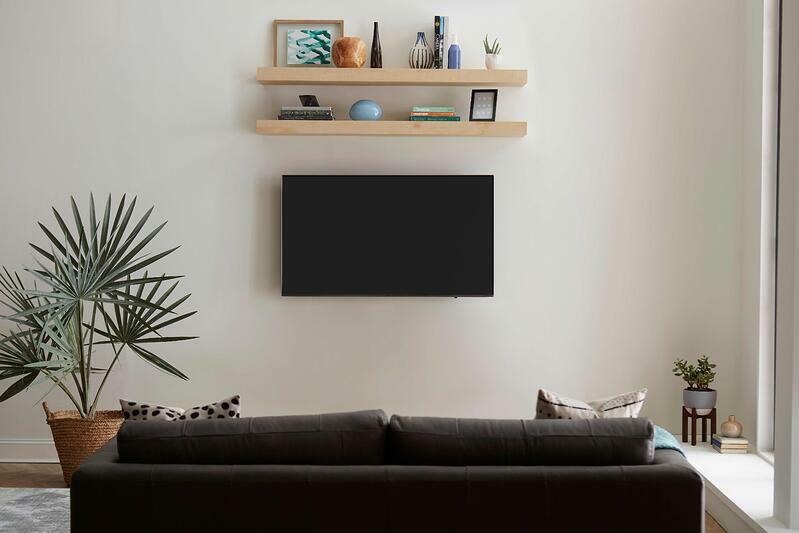 We know mounting a TV can sound like an intimidating project, but if you can install floating shelves, mounting a TV shouldn't be much of a challenge for you – and it only takes 30 minutes! This step-by-step guide walks you through everything you'll need to know – through picking the right mount style to the actual installation. Additionally, our MountFinder tool tells you which mounts are a fit for your specific TV model, and our HeightFinder tool tells you exactly how high to place your TV on the wall - eliminating the need for guesswork. 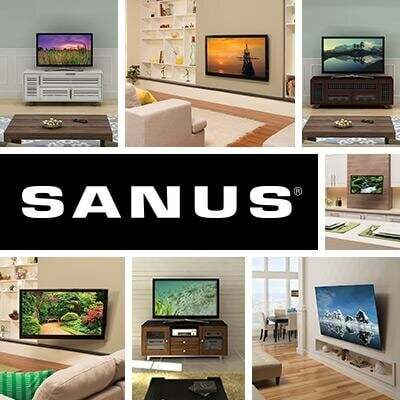 So in no time, you’ll be sitting back and enjoying your newly mounted TV.